Sustainable Food Supply Foundation has developed a draft program for an international two-day conference about “Sustainable World Food Supply”. The concept lends itself very well to cooperation with embassies, farmers organizations and governmental representatives of European, Asian, African and Latin American countries, the United Nations, the World Bank, the IFAP, scientific institutes and other organizations. They can present sample projects, which prove that sustainable, the region-oriented agriculture geared to ecological aspects and biodiversity is successful and (also in business matters) rewarding. In addition, international authorities in the field of sustainable agriculture, biodiversity and restoration of ecosystems could give their comment on these practical examples. – sustainable livestock and reforestation. During the conference initiatives, activities, businesses and people from the different countries will be associated with Dutch companies, organizations and governments, both during and after the conference. 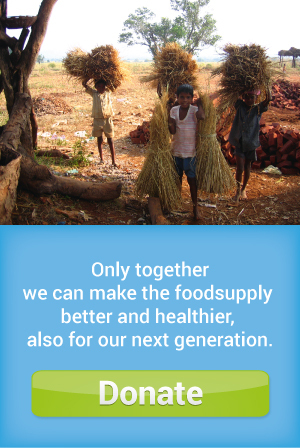 Lasting relationships between various partners are facilitated and continued through a specifically for this purpose developed website www.sustainablefoodsupply.org. There will also be a range of customized courses. With this international conference and with the pre- and post-process, the initiators and their partner organizations want to promote a shared vision and cooperation that respects the interests of both large and small farms as well as the environment and biodiversity. The working languages of the conference are English and French. Please find on this site the draft program. Dates and location still to be determined. The international field of participants is determined in consultation and may include representatives of farmers organizations, agricultural and horticultural organizations, governments, public authorities, financial institutions, investors, fundraisers, import and export companies, providers of services and technology on the behave of sustainable agriculture, water, energy, research and education, fair trade and conservation organizations and NGO’s.